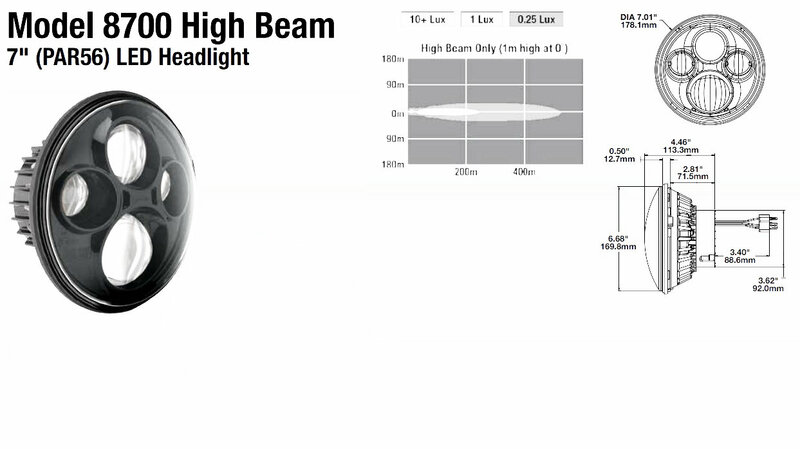 If you are in need of a high beam only 7" round LED light this Model 8700 High Beam 7" Round LED Headlight 12-24V works great! Designed by J.W. Speaker for multiple applciations from Agriculture to Fire/Rescue/Law Enforcement, Construction, Mining, Military, and more! Made from Die-Cast Aluminum with a polycarbonate lens, black bezel, and IP67 waterproof/dustproof rated for extreme durability. Produces 1900 Raw Lumens. Operating voltage is 9-32V DC. Amperage is 4 Amps at 12V DC and 2 Amps at 24V DC. Replaces H4, H6024, PAR56, Type 2D1 headlights. HIGH Beam Only! Sold individually.